Mount Grace Priory near Northallerton in Yorkshire, England is a remarkable place to visit. Between 1398 and the Dissolution of the Monasteries in 1539 it was home to a community of hermit monks of the Carthusian order. The ruins of the cells of the monks surround a spacious courtyard and one cell has been restored. On the site of the high altar there is what from a distance appears to be a cross, but as you get closer it is clear that it is a very striking sculpture of Mary offering the Christ Child for God’s purposes. The sculptor was Malcolm Brocklesby who lived from 1933 to 2010. 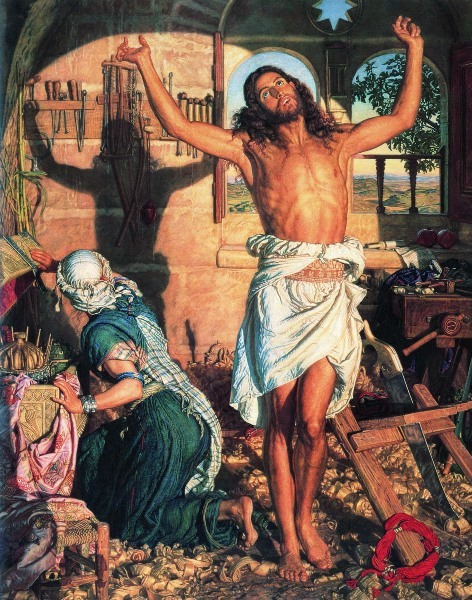 His original inspiration for this work came from Holman Hunt’s The Shadow of Death (c. 1873) which is in the Manchester Art Gallery. In that painting Jesus is stretching out his arms after a hard day’s work in Joseph’s workshop and the evening sun casts a shadow on the wall behind. Mary, who is kneeling, sees the shadow as a premonition of Christ’s crucifixion. Brocklesby had in mind to make a statue of the Madonna herself as a portent of the crucifixion and that if it was displayed, it would be lit in the low foreground to cast a shadow on the wall behind. However, as he worked on the maquette it seemed logical to fashion the back of the figure itself as the cross. 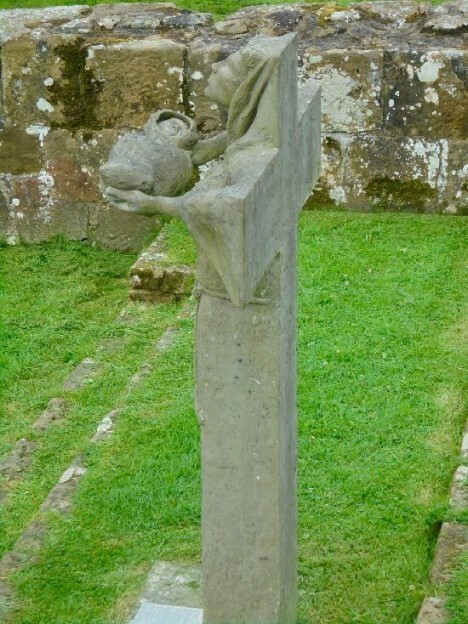 This determined Mary’s posture with her shoulders back and with her arms horizontal, holding the Christ Child high in a position of dedication. This Madonna is not the meek and subservient figure portrayed in many Renaissance works, but a determined and intelligent young woman who understands the wonder and the importance of her calling as she dedicates her Child to the purpose of her Creator. She is also aware of the suffering that this will entail. The figure of the Madonna is integral with that of the Cross, the stark and terrible symbol at the heart of Christianity, which is an inescapable part of her existence. Her expression, however, is more of serenity than anguish. She is looking beyond Calvary to the Resurrection and the way in which she holds the Christ Child high suggests the subsequent Ascension rather than the immediate prospect of a sacrificial death. It is noticeable that Mary’s dress, with the rope tied around her waist, is a reminder of the monks who lived and worshipped on this site. Perhaps the sculptor fashioned his work in such a way that the figure can be seen as either male or female and so can speak to everyone about giving all that we have to God. Mary stands erect offering her only son, just as Abraham was ready to sacrifice Isaac and God was ready to give his only Son. It is a position of total vulnerability and availability to God. This is the crossed-out life, indeed from behind the sculpture only the cross remains. Mary is fused with Christ in the cruciform shape. “I am crucified with Christ,” St. Paul says to describe this loss of ego and abandonment to the will of God. 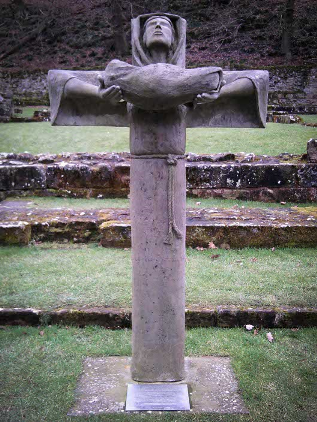 Malcolm Brocklesby: Madonna of the Cross, 1996, Mount Grace Priory, Yorkshire, England. Malcolm Brocklesby (1933-2010) was a mining engineer who took up sculpture. 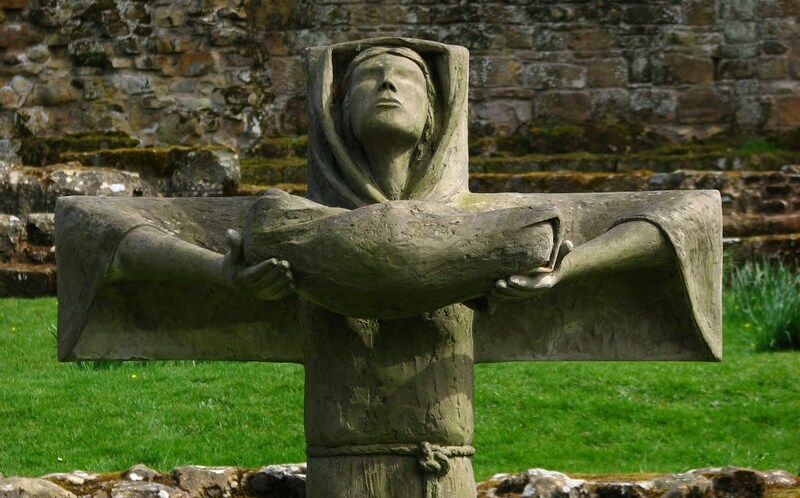 His sculptures are in numerous collections in Yorkshire and beyond, his best-known pieces being his military figures The Defenders at Helmsley Castle and his Madonna of the Cross on the high altar at Mount Grace Priory. David Pott lives near Bishop Auckland in County Durham. He has had a long interest in the history of monastic communities and the development of new monastic communities. David and his wife Pam are companions of the Northumbria Community, see www.northumbriacommunity.org. For information about visiting Grace Mount Priory please see http://www.english-heritage.org.uk/visit/places/mount-grace-priory/.